Fieldwalking recovered pieces of Roman, medieval, post medieval pottery and tile. Later metal detecting found an Iron Age copper alloy harness fitting decorated with enamel, Roman, medieval and post medieval coins and a post medieval jetton. Pieces of iron smelting waste were also found. This has been interpreted as part of an area of Roman settlement. 1990. Fieldwalking finds. Finder's Site M18. Roman, medieval, post medieval sherds, and tile. For (S1) and full details of conditions see file. Early 1992. Metal detecting finds. Six Roman coins 1st to 2nd century. See list in file. Coins identified by J. Davies (NCM). Iron Age enamelled bronze escutcheon from horse trapping: circular, three voided circles infilled with red enamel, see (S2 and S3). One Roman coin found in further metal detecting survey. See list in file. A. Rogerson (NLA) 8 April 1993. One large and two small pieces of tap slag found on surface. D. Gurney (NLA) 1 March 1995. (S4) describes this as a Roman settlement site active from the 1st or 2nd century through to the 3rd or early 4th century. M. Dennis (NLA) 5 May 2006. <S3> Illustration: White, S.. 1992. 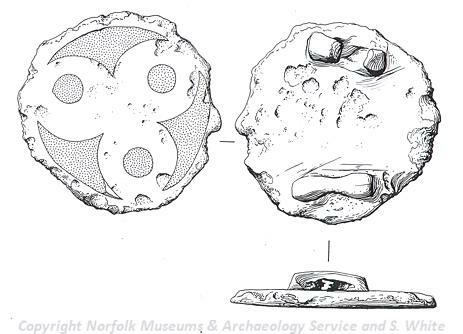 Drawing of an Iron Age enamelled bronze escutcheon from horse trapping.. Paper. 2:1. <S4> Article in serial: Davison, A. 1995. The Field Archaeology of the Mannington and Wolterton Estates. Norfolk Archaeology. Vol XLII Pt II pp 160-184. p 165.